For the past few days the weather has completely changed in Bangalore…its chilly cold and rainy. It could be due to the cyclone Ockhi that hit Kerala.Unlike homes in the western world, there is no central heating system so one has to wrap up pretty warm. I hate wearing a sweater as I find them too itchy so come evening and I wrapped myself in a shawl and topped with a thick bed sheet. After that didn’t want to budge even a millimeter. Hot water and hot milk becomes one’s best friend. It also meant that I didn’t want to have my usual smoothie for breakfast. I wanted something hot that would warm up the body. What better breakfast treat is there than hot parathas and masala tea. The #121st theme for FoodieMonday/Bloghop is Pushpita’s recipes. Who is Pushpita? She is one of the members of the FoodieMonday group. In all we are 15 members. We usually take turns to decide on the theme. The 121st theme was to be decided by Pushpita. However, she has not been able to blog for a while because of health issues. So as a team we to decided to shower her with some love by cooking a recipe from her blog Pushpita’s Chakhum. Please do check out her blog for some unique Manipuri recipes. As she clarified with us, she is not from Manipur but is a Manipuri from Tripura. Many of the recipes use herbs and vegetables that are indigenous to the region where she hails from. I know she tries to grow many of those herbs in her little balcony garden. So Pushpita, hope I’ve done justice to the tan recipe I chose from your blog. 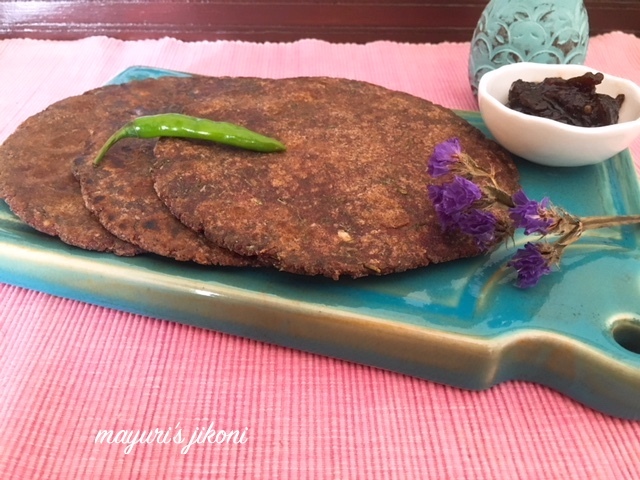 2 reasons made me choose this recipe, first that you’ve used the healthy millet, ragi or finger millet and secondly I was looking for a breakfast recipe. I know tan can be enjoyed anytime of the day but my family had it for breakfast with some masala tea and pickle. I am glad that you chose to make this not in the batter form but instead made a dough and cooked it like parathas. Wishing Pushpita a speedy recovery and our love and prayers are with you. Mix flours and salt. Add hot water and mix it well with a spoon. Add garlic, ginger, chili pastes and chopped fresh dill. Mix well and let the mixture cool down. Rub some oil on your hand and knead the dough till it becomes soft and smooth. Heat a tawa on medium heat. Divide the dough into 6-8 parts. Roll one part into a ball. Roll it in the extra flour. Using your hand, pat out the dough into a circle of 5-6″ diameter. Keep on dusting the worktop or board with flour so that the dough does not stick to the surface. Place the flattened dough on the hot tawa. Let it cook for a minute or so. Flip it over. Let it cook for a minute. Drizzle little oil around the tan and cook both sides till done. It should appear light reddish in colour. Repeat steps 7-13 with the remaining dough. Serve hot tan with some tea and pickle. I added chopped dill instead of chopped garlic chives that Pushpita used. The dough is like the bajra rotla dough. If you can’t shape it with your hand, then gently roll it using a rolling pin. I added garlic, ginger and chili for more flavor. Lovely post di..the ragi tan looks tempting ! Mayuri, as soon as I read the ingredients my mouth started watering, so tempting and delicious looking ragi temae tan. Bookmarking this. Tan looks inviting Mayuri. Healthy share and perfect breakfast. I liked this spiced Ragi Temae Tan. I am a savoury breakfast person so this is just up my street! Awesome pancakes!Just love the recipe! Wow! What a fabulous share. It is interesting to learn about foods from various regions. Beautiful gesture by you when you suggested to shower some Team Love Mayuri, coming back to the recipe, its beautiful, healthy and will try out soon. Lovely ragi flatbread. It is healthy and looks tasty also. Ragi Tan seems delicious and nutritious. These look so healthy and super tasty too. I love to have hot parathas for breakfast too. Healthy bread.. and nice to try out recipes from different cuisines. The recipe looks very healthy and filling dish. What a healthy recipe dee…Pushpita has some amazing recipes on her blog. I am sure the addition of ginger and garlic must have given the recipe more flavour.